Sometimes I forget about posting things other than hearty meals and baked goods, but since I often turn to food blogs for salad ideas, I thought I should contribute as well. It’s not that I don’t love a good salad; on the contrary, when I’m in the mood for salad, I can eat it daily. But so often I go with a simple salad and throw my energy into the meal. 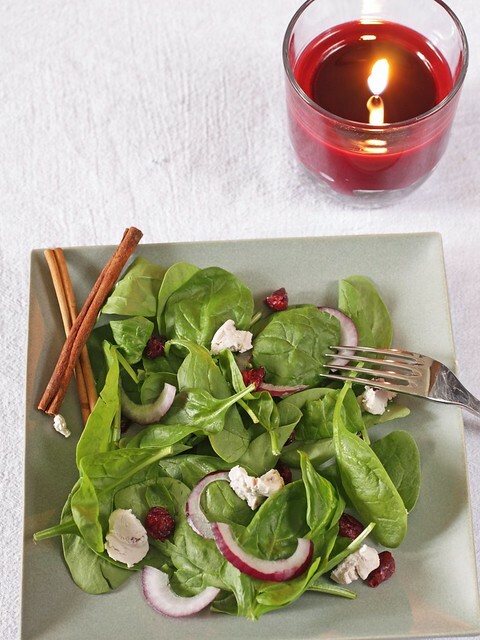 Since cranberries are everywhere, I thought I’d pair them with a basic spinach salad, yet give it a bit of a twist by using cinnamon cranberry goat cheese. It’s not available everywhere, but plain goat cheese works just as well. Whisk olive oil and vinegar until blended, season with salt and pepper to taste. 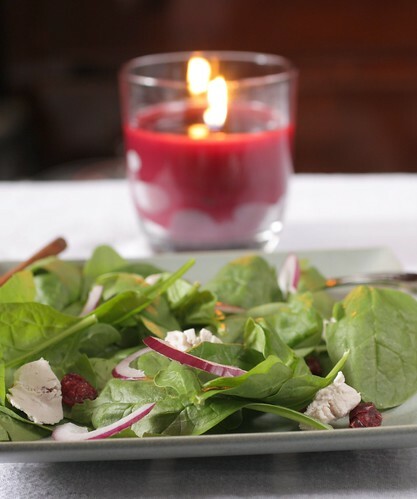 In a large bowl, toss the spinach with the dressing. Top with red onion, cranberries, and crumbles of goat cheese.